Home Snowboard & Ski Goggles RayZor Black Framed Goggles With an Anti Fog Smoke Mirrored Vented Double Lens. 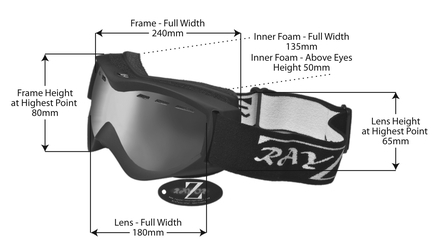 RayZor Black Framed Goggles With an Anti Fog Smoke Mirrored Vented Double Lens. Lightweight Black Goggles with a Shatterproof Polycarbonate Frame and an Adjustable headband Bearing the RayZor Logo. Fleece Lined Soft Foam Padding around the Inner Frames for Comfort Fitting. These Goggles will fit most makes and models of Ski Helmet. UV400 Smoked Mirrored Anti Glare, Vented Spherical, Wide Vision Clarity Lens. The RayZor Smoked Mirrored Lens Provides True Colour Definition, Reduces Glare and Is An Every Day All Purpose Lens. The RayZor Dual Ventilation System Ensures no Condensation, Misting or Fogging. The Vents on the lens allows the air to circulate and provides clear vision at all times. RayZor Black Framed Goggles With an Anti Fog Blue Iridium Mirrored Vented Double Lens.